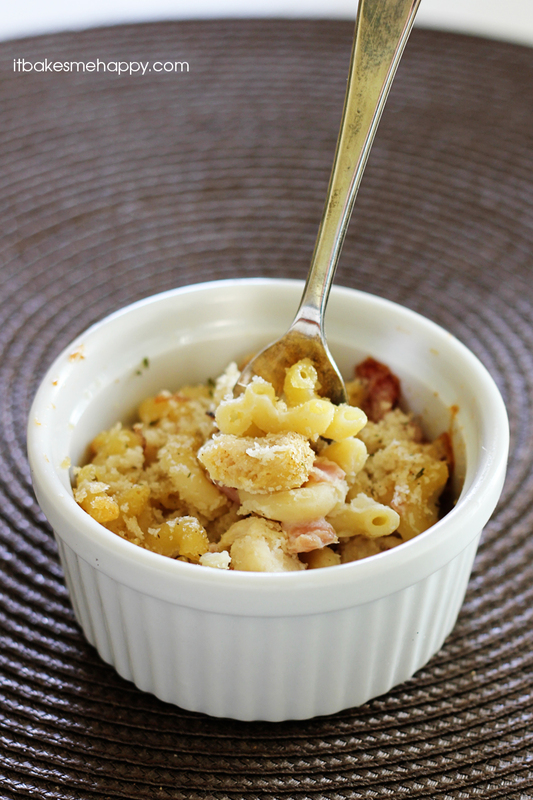 Enjoy a quick and easy comfort food dinner with this Chicken Cordon Bleu Mac N Cheese. This past week has been crazy busy! The holiday Monday was so nice to relax and spend the day together as a family. Then early the next morning I started having contractions and a couple hours later we were on our way to the hospital. We spent a few hours in Triage, but once I was admitted it didn’t take too long – and by mid day our sweet little boy had made his appearance. So you can understand when I say last week was crazy, I mean I have an almost one week old and a toddler, life is good. I did some cooking and baking in the days before the arrival of our son and today I am sharing a super easy and quick recipe for Chicken Cordon Bleu Mac N Cheese. We loved this meal, it was so rich and creamy and satisfying; a true comfort food. I even told my husband that since this was so easy compared to the traditional method of Chicken Cordon Bleu, that I may never make it any other way. Grab these ingredients next time your at the grocery store and come dinner time, you’ll be thanking me and yourself for this meal; enjoy and happy baking! Cook the macaroni according to package directions, al dente is good for this recipe. In a medium sauce pan melt the butter, add the flour and cook for 1-2 minutes. Add the milk and stir until a thick roux is achieved, you can add more milk if you like a thinner sauce. Add the cheese and stir until melted, toss in the macaroni, chicken and ham and stir to combine. Preheat your oven to 350º and spray an 8"x8" baking pan with cooking spray. Season the mixture to taste and transfer to the baking pan, sprinkle on the Panko bread crumbs and bake for 25-30 minutes until golden on top. What a neat comfort food idea!! 🙂 Pinned for later! Yummy! Emily, this sounds absolutely delicious! The baby is precious, congratulations and thanks for sharing his sweet little face with us! Hope you both are doing well! oh, this sounds delicious. Will definitly be making this soon! I cannot tell you how delicious this sounds – of course I am a complete cheese fanatic. Cannot wait to try this. Annnnd just LOOK at that precious baby boy. Oh my gosh so may memories flooding back. Congratulations to you and your Hubs!! He is just adorable. And this mac n cheese looks delicious! We will be featuring it at next week’s MM party. Thanks for sharing, Emily! Love mac and cheese so pinned to try! Congrats on the new baby!!! Oh, I could eat him up!! The blog looks great too Em, you are one talented mama!